Check out all those strings of pearls on the back. Aw yeah. I friggin' loved this thing, though I had to wear two sets of Spanx to fit into it. We made the flower baskets & spray-painted them silver, because our colors were burgundy and silver. I have no explanation for this color choice, other than the fact I owned a burgundy leotard (remember the ones that snapped at the crotch?) that I really liked at the time. So happy we were on the home stretch. This was before the dreaded Electric Slide incident. That's my grandfather. He... didn't smile much. 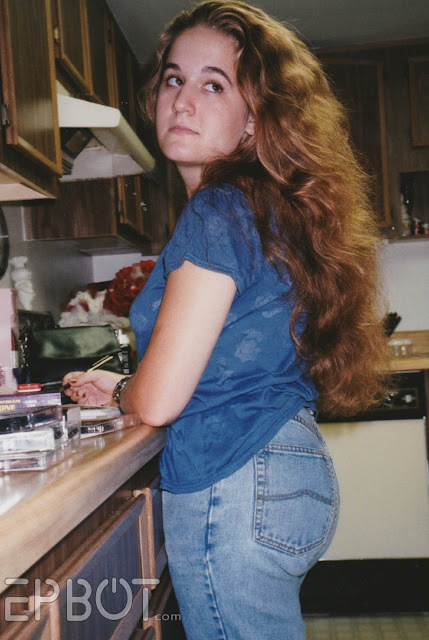 I'm pretty sure John married me for my hair, frizz and all. You can see the wedding flowers in the background, but also please note the Star Trek book beside me on the counter. John knew what he was getting into. Good grief, you two kids were glowing like your Harry Potter Christmas tree on your wedding day!!! :-D CONGRATULATIONS on 20 amazing years, and wishing you 20 decades more!!! Congratulations! Love your hair in that last shot. Happy Anniversary to you both!!! Congratulations on getting to the milestone together. i dont think i wouldve noticed the earring if you hadnt mentioned it honestly lol, i love the whole thing, happy anniversary guys! Thanks for sharing - I had the same style wedding dress and my mom actually saved it thinking my daughter would want to wear it one day! She. did. not. Happy anniversary and many, many more! Thanks for sharing these fabulous photos and stories. We just celebrated 20 yrs a few weeks ago, too. Happy anniversary! You guys look wonderful. Your hair was fine, the dress was beautiful, and you guys had your priorities straight and were obviously happy and in love. Happy Anniversary. Happy Anniversary! It sounds like you two were made to work side by side, it's adorable! Happy anniversary! You guys are great - and great together! Here's to many more years (and project posts?) together! Happy Anniversary! Your wedding sounds a lot like mine. Got married for under $2000 with a little over three months to plan. Most of the guests were also Baptist, there was very little dancing (though I do have pics of my super conservative Gramps busting a move!). 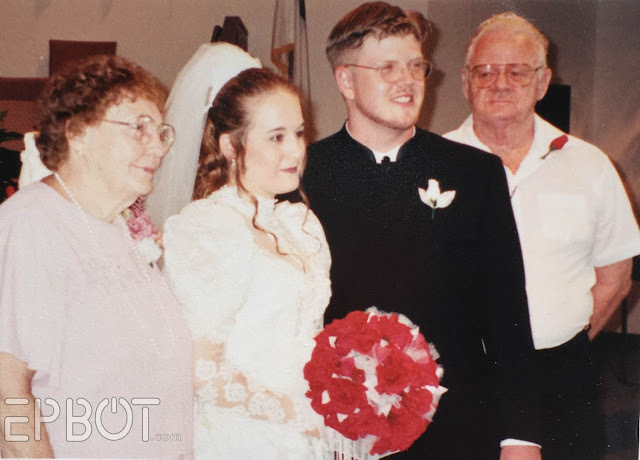 I'm super thankful there was no Pinterest or TLC wedding shows back then! We just celebrated 14 years so even though it wasn't fancy, it worked out OK! YOU GUYS WERE SO CUTE! Happy Anniversary! We did ours on the cheap as well! I made my dress, with the help of a fashion student friend (laura ashley floral style), We borrowed wing tip shoes and 50's tux pants/bowtie from the costume shop I worked at. Chris's mom made ALL the food (5 trifles for 40 guests), someone donated the wedding cake and flowers as a gift, someone did my hair as a wedding gift. We paid for a rental tent for the lawn, folding chairs, dishes and a rent-a-minister. I think it was under a $1000. We're coming up on #28 on August 25th. Why dig a financial hole to start your married life together? This is completely beautiful from start to finish! You two are such a wonderful example of true love. Thank you so much for sharing! ♡♡♡ Happy Anniversary!!! Quite an accomplishment. Well done and I hope you have decades more together. We're at 20 years this year as well! And we did all of our own stuff as well--though, we did recruit friends to help cook. Friends who are waaaay better at the cooking than I am! It also helped that the best man owned a bar and we took over a portion for the "reception". And also? I wore a blue dress I already owned. :) Our daughter was horrified when she first found out I didn't actually wear a wedding dress. She got over it, and now thinks our whole DIY wedding was awesome! Thank you for this post. We're 2.5 years out from 25 years and I keep thinking of how I'd do my budget wedding over again, too. But really, no, it's only about us and our life together. I think we're just going to run away (travel). Happy Anniversary, I totally feel you on the no-dancing Baptists, and John charming sewing shop grandmothers into teaching him to make your veil is one of the sweetest things I've ever heard! YAY for budget weddings! I had one too for the exact same budget almost 22 years ago. Where was Pinterest when we needed it?!?! Congratulations on 20 years and may God bless you with many many more happy years together! Awwww, you guys are SO CUTE! I *love* the pictures (especially unimpressed grandpa!) Congrats on 20 years! Husband and I are closing in on 11.5 years. Not always easy, but we've grown and shaped our lives and in each other in the best ways. He made your veil! I love it! Happy Anniversary! You guys are totally adorable! The veil bit made me tear up a lil... How many guys would learn to make something like that for their women? Happy anniversary you two - and many many more. and I blamed it on allergies. So cute about the veil. Grandpa looks like he's giving John the evil eye! But we all know that John is awesome! My mom thinks he was looking at John's earring, since that may have been the first time he'd been close enough to notice it. ROTFL! Happy Anniversary! You did it right. Marrying the love of your life at a wedding that you (or your dad!) could afford and the love of your life made your veil (awwwwwww!). I had a $100 wedding dress too. Off the clearance rack at David's Bridal. It was everything I was looking for and I looked great in it. I shudder at brides spending $5k-$10k on Say Yes To The Dress. Yay to $100 wedding dresses and yay to 20 years of marriage! That is the most 90's wedding ever! Happy anniversary you guys! I am picturing John with those grannies learning...veilmanship, and it is the BEST THING EVER! This post totally made my day. You guys are the best! I love this post! Abd you are so right: it's about the marriage not the wedding (though I had a pretty great one, festival style :D). Happy anniversary to my two favorite-people-that-I've-never-really-met! While you both individually are pretty cool people, together, you are definitely greater than the sum of your parts. You make each other better, and we love who you've become together. "...charmed his way into a pack of grandmothers..." Roll for charisma? Hold the bus up there, girl, you ain't done yet-- You think I'm gonna let you, the Queen of Cake Wrecks, post your wedding photos and NOT SHOW US YOUR CAKE?! SHENANIGANS!! Also; why burgundy? Because burgundy was THE Color of the 90's. Burgundy hair (with two li'l pieces/locks dangling from each side of the forehead), burgundy lipstick (or brown, which always looked like one had just eaten a Fudgcicle) and nails, burgundy tights and leggings... BURGUNDY. STORM! I was thinking the same thing as I scrolled... John didn't marry her for her hair; he married her for that glorious bottom! Hahaha! "Pant-load of pirate treasure" cracked me up! Also, happy anniversery! It's your porcelain wedding so maybe you can break some cups together? I second the request for the photo of the wedding cake. We got married for just a wee bit more than you. Like you, ours was about US and not the DAY. So many people lose sight of that. I meant what I said when I repeated after our Beloved Rev. Stuart, "forsaking all others, til death us do part." We will celebrate 30 in April. As long as we are together, that is all I need. He truly is my best friend. AND, he's a John too!! Happy Anniversary to you both. Boy have I got an Electric Slide story for you! The DJ at my Bat Mitzvah played that horrid song even after I had specifically told him not to. So, in true almost-13-year-old-girl fashion, I stormed out of my own party and went to hide in the bathroom until the song was over. Thankfully, after telling that story to the DJ for our wedding, he did not make the same mistake. I completely agree with your advice not to go into debt just to have a wedding. That's no way to start a marriage. A wedding is just one day, marriage is (hopefully) a lifetime. Happy Anniversary! Love the pics. Thanks for sharing, hope your trip is awesome. Ha! I gasped about the earring and then scrolled where you said we don’t talk about the earring. So much fun! My wedding was $200 in Hawaii y’all!! It was $80 for my casual Hawaiian dress (we were already stationed there with the army), $100 for the lady to officiate the wedding, and $20 for an ice cream cake from BaskinRobbins. But Hawaii is beautiful so we just stood by a waterfall with our parents who had come to visit and it looked fancy. We were married in 2002 (feb 2 so I could remember it). Happy anniversary! Happy anniversary! I may or may not have said "awwww...you guys" out loud at the pictures. My husband and I celebrated 25 years this year, and like you, just wanted to be married. Love the collar on John’s tux. Happy anniversary! Here’s to one hundred more! What a lovely post....happy anniversary! I am in the midst of helping my 22-year old son and fiance plan their wedding on a $4000 budget and I love what you say about it just being a day. We keep telling them that the marriage is what's important, not the wedding. We are trying not to let them get caught up in little details and instead to focus on the relationship. We are having fun! Oh, and did I mention...it's in HAWAII!! Happy 20th! Our 20th is coming up in October so you’ve been married a few months longer than us (which is really weird to me, because I have always felt like I’m a decade older than you and just recently realized we are almost the same age. You age VERY well Jen!). My mother had a wedding very similar to yours and was bound and determined that her daughter would have THE DAY, so on my wedding day my mom got the wedding of her dreams (don’t worry, she wasn’t a bridezilla, but I suspect she would have made a fabulous wedding planner in an alternate reality). We just found out that we will be closing on our forever house on our anniversary. After 2 decades of marriage, three continents, four states, and 17 moves we will finally be settling in one spot! Here’s to the everyday, the normal, and to all the messy middles, may you enjoy them all! Congratulations you two. The story about John making the veil made me tear up at work again. Thank you for sharing. There's not a single photo in here where you and John are anything BUT beautiful! So happy for both of you - 20 years is an amazing accomplishment. And you still LIKE each other - bigger accomplishment!! Awww, happy anniversary, you two!! Thanks for sharing so much of your lives with us weirdos online. <3 And I love your dress, even if it's a little OTT. I love the stories and photos so much!!! 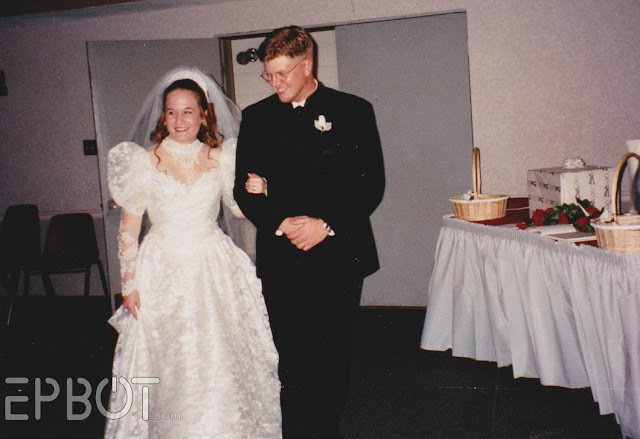 I think most of us married in the 90s might have had dresses that didnt eventually fall into the "classic elegance" category, but it's enough that WE loved them. (And knowing that my prom dresses were WAY worse.) Happy anniversary, you crazy kids! These photos SCREAM 1998 and I LOVE IT! Also, both you and John are hotties!!! Happy Anniversary!! We always tell couples we know that it's not the wedding that matters, it's the communication and love between two people that makes the marriage. I love that you guys had so much fun putting it all together. I love it all!! I think all of us who were married pre-Pinterest should get a re-do, haha. Also, I keep telling my husband that I want him to pierce his ears...and then not wear earrings. 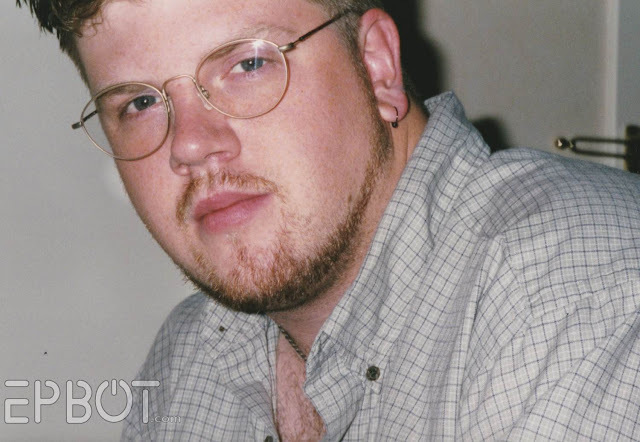 I just love the tiny hole in a dude's ear that says "yeah, I went there." Congrats on your anniversary, here's to many more years of learning and loving! Happy anniversary to you both! Here's to many more happy years! Congratulations on 20 years! I love Grandpa's side-eye for John. Happy Anniversary and congratulations on such a milestone! I'm so glad you both found each other, someone who can compliment you so well. God's blessings on many more years together! And thanks for sharing your story with us! Congrats and well done :-) (both the wedding and the resulting marriage). Happy Anniversary Jen & John! The two of you haven't haven't changed a bit. *waving from 1997* My bridesmaids wore that same silver dress! Happy Anniversary! I love your dress! I mean, it's not what most would pick today, but it's just so FLOOFY! And the joy on your face in the mirror makes it even more perfect! None of us are at all surprised that John made your veil. That's just the kind of guy he is. You snagged a keeper there, missy. That sounds awesome! Not sure how often we'll make it to the Westin this year, but if we do I'll look for your room. Oh, that gorgeous hair! Happy anniversary! Happy Anniversary! Your hair is glorious! my anniversary is this month also, 23 years! wouldn't trade it for anything :) hope you guys have another fabulous 20 ahead of you!! Love this! 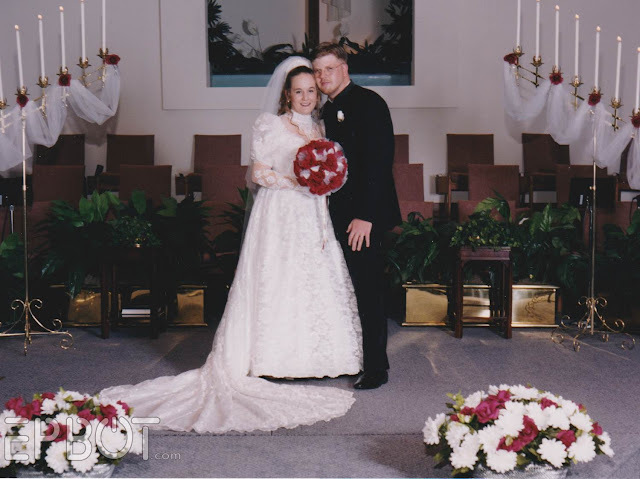 My hubby and I just celebrated our 19th anniversary, no dancing (because Baptist), our wedding colors were silver and burgundy too, and we had those exact same bridesmaids dresses!!! Thanks for the trip down memory lane! :) Happy anniversary! Happy 20th, Jen and John! You two started out cute together, and now you're even cuter! It was meant to be. Such happiness when soulmates find each other. Wishing you love and peace and many more years of projects, cuddles, and bliss. Thank you for sharing these beautiful and sweet photos with us! You guys are awesome! Happy twenty and cheers to many more! Happy 20th! The photos and veil story are utterly delightful (I just may have snort-laughed at Grandpa...your Mom's theory is hilarious). Wishing you both many happy years ahead. Are you kidding? He married you for that cute little tush! Happy Anniversary! My hubby and I got married on the judge's lunch hour, with our moms as witnesses, whom we took out for lunch afterwards. Then we rushed home to relieve the babysitter (I had been married before and had 3 children) and life went on without pause. That was 35 years ago next month! You guys are goalz. You've got one of the best marriage/partnerships I've ever had the privilege to witness long distance on the internet. I can't figure out the math on your 20 years, though. Were y'all married at age 14??? Congratulations!!! We are at year 15, and we also had a home-made wedding. I wore my mum's wedding dress and veil that my gran made, $8 slippers from Kmart that my dad found, and our wedding waltz was "Poisoning Pigeons in the Park". No slides. Congratulations! We had a DIY wedding too, 33 years ago. We silkscreened all the invitations (covered a friend's apartment with drying pieces of paper), my mom made almost all the food (I think we helped somewhat), my dress cost $60, and we brought some close friends we didn't get to see that often on our honeymoon (we thought it was silly for them to fly up for one day and then we'd leave, so we brought them with us!). Happy memories--and sounds as though you have happy ones too. You're right: it's about the journey. My husband can still make me laugh harder than any human being on Earth, something I cherish. Thank you so much for sharing! I love the pics, and I love that you are setting such a good example of what's important in a wedding (hint: not the money it took or the rock awesome DJ) and marriage. We're only at 7 years, but we look forward to being as cute as you when we hit 20! Happy Anniversary to my all time favorite people I only know through internet <3. I squealed a bit when I came to the photos. Thank you so much for sharing them! :D We had a low budget wedding too. That was five years ago, but we've been together 15 <3. It's very important to me that people have the wedding that they want and not the one that they think other people expect. It's your day after all. Holy cow! I swear your dress is the same dress 3 of my sisters wore for their weddings! I got married a year later and was actually glad I was a little too big for it. It was a beautiful dress, but not really what I wanted. But congratulations! I actually heard a study recently where they said that people are typically happiest in their marriage around the 20 year mark. So enjoy your wedded bliss! Im surprised you didn't dress as Bride of Vadore. Happy anniversay! And, hey! 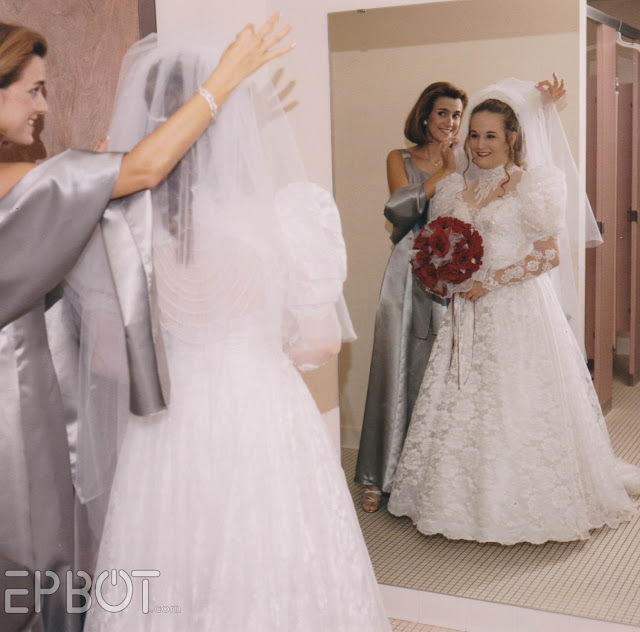 I had that exact wedding dress when I got married 20 years ago! It was a dress two of my sisters had worn, and I hate shopping, so I happily took it. Congratulations! Couldn't happen to two nicer people. Also... Baby Jen!! Baby John!! <3!!! Your dress was GORGEOUS! And I love the bouquet- soccer ball did not enter my mind when I saw it. We also returned from our honeymoon with no debt. People come to your wedding because they love you, not because they are expecting expensive decor and entertainment, but no one talks about that aspect. Congrats to you both! 1) Congratulations! We also celebrated 20 years in early August. It has NOT been easy...but we're in this together. 2) There wasn't a DJ at our wedding because...VERY Baptist. 3) I was "Awwwww"ing out loud at this post. You and Jon are the best. Love your faces!